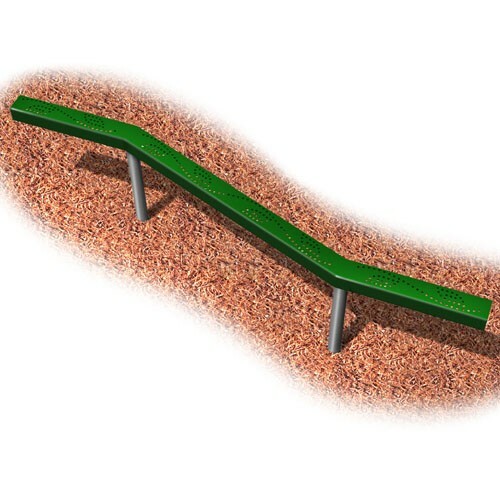 The UltraPlay Zig-Zag Balance Beam is a fun accessory for any commercial play set. The kids will enjoy testing and improving their balancing skills while interacting with other children. The UltraPlay balance beam is safe and fun. With a low fall height and a slip resistant coating accidents are cut down to a minimum. The UltraPlay Zig-Zag Balance Beam is a fun accessory for any commercial play set. The kids will enjoy testing and improving their balancing skills while interacting with other children. It is constructed with a high quality thermoplastic coating for traction and durability resists impacts and is UV stable. It also includes the In-Ground mounting kit for the 2-3/8" support posts.